There are great stands of Alexanders in full flower on either side of the Rye Harbour road softening the edges of the rather less than beautiful industrial units down the road. 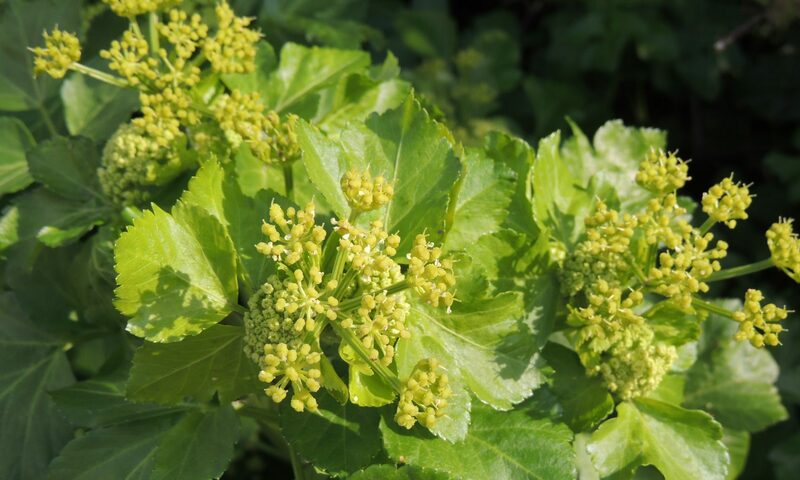 Alexanders are the first seaside greenery of the year and what greenery, tall and frothy with bright fresh green umbels. I’ve also spotted clouds of them on the Military Canal Road as you come into Rye and by the river before Iden. Alexanders (Smyrnium olusatrum) are umbellifers native to the Mediterranean where they were known as the ‘pot herb of Alexandria’ as every part of them is edible and I can see why the Romans would want to bring them here to use as a crop plant as their stems, lightly steamed, have a delicious, individual flavour. I know, I tried some last night. Actually most umbellifers are edible and many are familiar to us and grown for their roots – vegetables like carrots, parsnips, Florence fennel, celery and herbs such as dill, cumin and coriander, caraway and the beautiful sweet cicely. However, if you are in foraging mode, the Umbelliferae family is a plant family that you need to have some knowledge of as it includes poison hemlock and giant hogweed. An umbellifer is a member of the parsley or carrot family. In order to identify them, the pattern to recognise is ‘the compound umbels’ – the stems of the flower cluster radiate (like an umbrella) from the same point at the end of a stalk. Then at the end of each of these stems radiates another ‘umbrella’ of smaller stems. 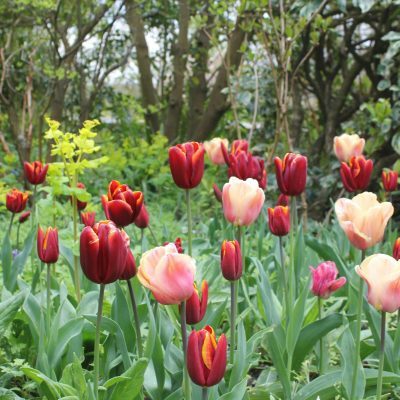 The flowers at the end of the stems tend to be small and are usually white, green or a pale pink. They are usually too small to be pollinated by bees and this is left to beneficial insects like hoverflies and also flies who generally pollinate the green flowers only. How do the flies recognise the differences in colour? I wonder. So growing umbellifers benefits the gardener as the hoverflies lay their eggs near colonies of aphids and the resulting larvae feast on the aphids once they have hatched. The frothy effect that umbellifers create in the garden is incredibly pretty and softens any planting scheme. I think that they are particularly effective in a natural planting. 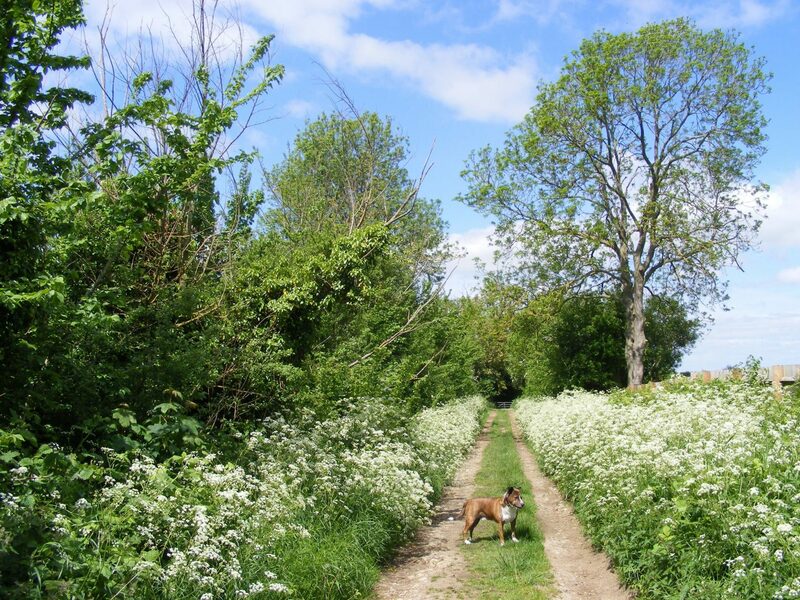 We all love cow parsley when it is in flower but like many umbellifers, it is a particularly successful self seeder and unless you want it absolutely everywhere, it’s an idea to control some of it once the flowering period is over. There’s a ‘garden form’ of cow parsley Anthriscus sylvestris ‘Ravenswing’ – dark ferny leaves and dark stems combined with white flowers make this worth growing especially as it is a useful plant in a semi shaded spot. When it sets seed, it will do a 50/50 split with half the seedlings coming true and the rest reverting. Selinum tenuifolium. Native to the Himalayas, this is a more refined form of Queen Anne’s Lace with lots of lacy bright green foliage topped by white flowers in June. Cenolophium denudatum described by Marchants Hardy Plants as ‘Parsley on Speed’ and also known as Baltic Parsley. 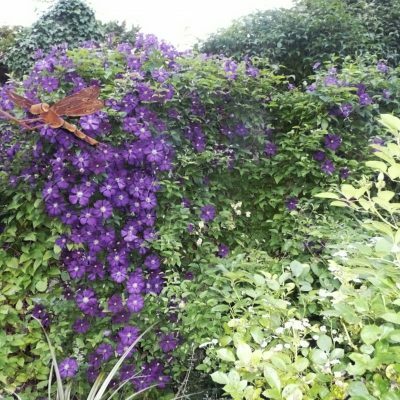 A great plant for a large border or natural planting as it reaches up to a metre in height. Chaerophyllum hirsutum ‘Roseum’ is a form of hairy chervil with soft, apple-scented foliage. It flowers at the same time as Clematis montana and looks good with the pink forms of the clematis. Ammi majus (Bishop’s Flower) – grow these in groups as a stand alone planting or use as a filler plant in the border. They grow to about four feet and flower for three months in the summer. Ammi visnaga, which looks a bit like wild carrot, and is stouter than Ammi majus but don’t be put off. They produce great seed pods later in the year as well as dense umbels from June through to September. Chiltern Seeds are selling a new variety of Ammi visnaga called ‘Green Mist’ with particularly large greeny-white flowers. Grow masses of dill (Anethum graveolens) as an ornamental annual as well as a culinary herb. Its acid green flowers look great grown with blue borage and bright marigolds. Angelica archangelica was introduced to Britain in the 16th century and, given a moist soil, some shade and plenty of room, produces a dramatically sculptural plant with an aromatic stem and roots. A biennial, once it has flowered it dies off but leaves, like many of the other umbellifers, lots of seedlings. It was grown originally for both its medicinal and magical properties and was considered to be an antidote to poisons, a protection against witches and a safeguard against the plague. It was also grown for its aphrodisiacal properties. Dark flowered Angelica gigas is grown by the field full in Korea, where it is native, and sold as… an aphrodisiac. Umbellifers germinate easily when the temperature rises to 50F or 12C but autumn sowing does produce stronger, bushier plants. If you are sowing large umbellifer seeds, a good tip is to plant them vertically rather than flat to reduce the chances of them rotting off. Finally, there are many, many wild umbellifers including Daucus carota, which is also known as Queen Anne’s Lace. There is plenty of this growing down by the sea at Camber and its seed heads later in the year are very striking. It can be distinguished from poison hemlock by the red flower in the centre of some of the umbels. As its seeds develop, the umbels curl upwards resembling a bird’s nest, hence its colloquial name of ‘Bird’s Nest’. Once the umbels have dried at the end of the year they detach and become tumbleweeds. 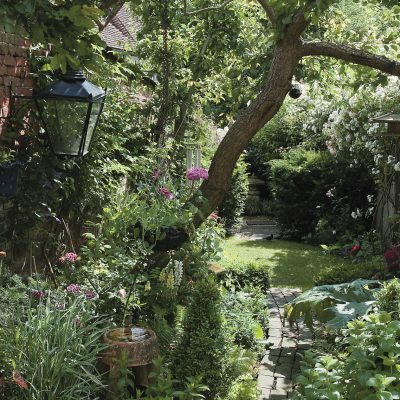 It is the sort of plant that you want to look at and enjoy rather than collect as its leaves can cause a severe reaction to the skin. Another wild umbellifer with similar, rather anti-social properties, is the yellow flowered wild parsnip which grows happily down at Dungeness. It is the direct descendant of our domestic parsnips. If in doubt, you’d recognise it by the distinctive smell of its leaves.